Gabe Logan Newell (/ˈnjuːəl/; born (1962-11-03)November 3, 1962), often nicknamed Gaben, is an American co-founder and managing director of video game development and digital distribution company Valve. After having dropped out of Harvard University, Newell spent thirteen years working at Microsoft on the first three Windows versions. With Mike Harrington, he co-founded Valve in 1996 and remains its managing director. After having dropped out of Harvard University, Newell spent thirteen years working for Microsoft developing Windows versions 1.01, 1.02, and 1.03, ultimately becoming a "Microsoft Millionaire". Newell has described himself as "producer on the first three releases of Windows". Inspired by Michael Abrash, who left Microsoft to work on the computer game Quake at id Software, Newell and another Microsoft employee, Mike Harrington, left Microsoft to found Valve L.L.C. in 1996. Newell and Harrington used their money to fund Valve L.L.C. through the development of Half-Life and GoldSrc. In 2007, Newell openly expressed his displeasure over developing his software for gaming consoles, particularly the PlayStation 3. In regard to the system, Newell was once quoted as claiming that developing processes for the console in general was "a waste of everybody's time" and "a disaster on many levels ... I'd say, even at this late date, they should just cancel it and do a do over. Just say, 'This was a horrible disaster and we're sorry and we're going to stop selling this and stop trying to convince people to develop for it'." Nevertheless, at Electronic Entertainment Expo in 2010, Newell appeared on stage at Sony's keynote; while acknowledging his past outspoken comments on console development, he discussed the open nature of Sony's PlayStation 3 platform, and announced Portal 2 for the console, remarking that with Steamworks support it would be the best version for any console. Newell has also criticized the Xbox Live service, referring to it as "a train wreck". He was also intensely critical of Microsoft's operating system Windows 8, calling it a "catastrophe" and a threat to the usually open nature of PC gaming. In December 2010, Forbes named Newell as "A Name You Should Know" mainly for his work on Steam having partnerships with multiple major developers. In January 2016, Forbes estimated the net worth of Newell as $2.2 billion, ranking 1415th among all global billionaires. In March 2013, Newell received the BAFTA Fellowship for his outstanding and exceptional creative contribution to the video games industry. Gabe Logan Newell was born on November 3, 1962 in Seattle, Washington. Newell grew up in Davis, California and graduated from Davis Senior High School in 1980. He attended Harvard University from 1980 to 1983, eventually dropping out. He married Lisa Mennet Newell in 1996. Gabe Newell's favorite games are Super Mario 64, Doom, and Star Trek, played on a Burroughs mainframe computer. Doom convinced him that video games were the future of entertainment, and Super Mario 64 convinced him that video games were art. He is a fan of My Little Pony: Friendship Is Magic. Newell suffered from Fuchs' dystrophy, a congenital disease which affects the cornea, but was cured by two cornea transplants in 2006 and 2007. Newell has said that he has tried to grow into his public image: "They hug me when they run into me. I'm not a hugging person, but that's what they want. I was with my kids the first time that happened in public, and my kids were pretty cool with it. But I wasn't. 'Dad, roll with it.' Even now, I'm learning from our customers." Within the gaming community, he is nicknamed Gaben, after his work email address. 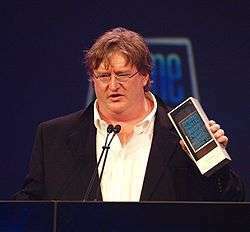 1 2 "Gabe Newell on Forbes Lists". Forbes. Retrieved September 2, 2016. ↑ Barret, Victoria (December 12, 2005). "It's A Mod, Mod Underworld". Forbes. Retrieved February 2, 2016. 1 2 CVG Staff (September 28, 2007). "Creative Minds: Gabe Newell". Computer and Video Games. Future plc. Archived from the original on December 11, 2014. Retrieved February 9, 2016. ↑ Keighley, Geoff (November 12, 2004). "The Final Hours of Half-Life 2". GameSpot. CBS Interactive. ↑ Androvich, Mark (October 11, 2007). "PS3 a "waste of time," says Valve's Newell". GamesIndustry.biz. Gamer Network. Retrieved February 9, 2016. ↑ Bishop, Stuart (January 15, 2007). "Gabe Newell: PS3 "a waste of everybody's time"". Computer and Video Games. Future plc. Archived from the original on December 23, 2014. Retrieved February 9, 2016. ↑ Bramwell, Tom (June 15, 2010). "Portal 2 coming to PlayStation 3". Eurogamer. Gamer Network. Retrieved February 9, 2016. ↑ Fahey, Mike (September 9, 2010). "Valve Figured Microsoft Would Fix The Xbox Live "Train Wreck"". Kotaku. Gawker Media. Retrieved February 9, 2016. ↑ "Valve boss Gabe Newell calls Windows 8 a 'catastrophe'". BBC News. BBC. Retrieved February 9, 2016. ↑ Chiang, Oliver (November 13, 2010). "Names You Need to Know in 2011: Gabe Newell". Forbes. Retrieved February 2, 2016. ↑ Ewalt, David M. (March 7, 2012). "Valve's Gabe Newell Is The Newest Video Game Billionaire". Forbes. Retrieved February 2, 2016. ↑ "Valve's Gabe Newell to be Honoured with BAFTA Fellowship". British Academy of Film and Television Arts. February 25, 2013. Retrieved February 9, 2016. ↑ Purchese, Robert (November 15, 2012). "Gabe Newell named as next AIAS Hall of Famer". Eurogamer. Gamer Network. Retrieved February 9, 2016. ↑ Staff (November 30, 2004). "Valve wins round one in Half-Life distribution debacle". SPOnG. Retrieved February 9, 2016. ↑ "Valve Handbook for New Employees" (PDF). Valve Corporation. p. 19. Retrieved September 1, 2013. ↑ Ingham, Tim (April 4, 2011). "Gabe Newell: My 3 favourite games". Computer and Video Games. Future plc. Archived from the original on February 11, 2015. Retrieved February 9, 2016. ↑ Fahey, Mike (April 12, 2012). "Gabe Newell Just Made My Little Pony Fans Extremely Happy". Kotaku. Gawker Media. Retrieved February 9, 2016. ↑ Chiang, Oliver (February 9, 2011). "The Master of Online Mayhem". Forbes. Retrieved February 9, 2016. ↑ Peterson, Andrea (January 6, 2014). "Gabe Newell on Valve's intimate relationship with its customers". The Washington Post. Retrieved February 9, 2016. ↑ Goldman, Tom (March 5, 2011). "Gabe Newell Gives Away Personal Steam Password". The Escapist. Defy Media. Retrieved February 9, 2016. Walker, John (November 21, 2007). "RPS Exclusive: Gabe Newell Interview". Rock, Paper, Shotgun. Bramwell, Tom (August 29, 2007). "Valve's Gabe Newell". Eurogamer. Gamer Network. Keighley, Geoff (November 12, 2004). "The Final Hours of Half-Life 2". GameSpot. CBS Interactive. Psycho_byte (June 26, 2003). "An interview with Gabe Newell". HL2Central. Game Central Network. Peterson, Andrea (January 3, 2014). "Gabe Newell on what makes Valve tick". The Washington Post.